UPDATE (reflections since starting, 06 June 2013) Aside from the excitement of the continual adventure and extraordinary situations I have found myself in, seeing the gradual change in geography and different cultures has been fascinating and the anticipation of what I´m going to see and experience on the remainder of the trip is a truly amazing feeling. Having a dream, making a plan and executing the plan (however extreme or absurd it may seem to some) is truly liberating. Life is too short to not follow your heart and your passion. Solo bicycle trip south from Prudhoe Bay, Alaska (northern tip of North America) to Tierra Del Fuego, Argentina (southern tip of South America). Following mountain ranges (including the Continental Divide in North and Central America and the entire length of the Andes), off road routes and remote wilderness sections where practical although some paved sections are inevitable. It is entirely self-supported and I will be camping wild where possible so I am carrying all my gear including tent, bike tools / spares, food, stove / fuel, clothes and anything else I need. This is my first ever bicycle tour and my reason for this trip comes from a combination of interests: multi-day hiking / camping, mountain biking, wilderness, new experiences, travelling and just seeing what I’m mentally and physically capable of. I don’t profess to being the first and this isn´t about going as fast as possible but as long as it’s pushing my limits and I’m enjoying it that’s good enough for me. 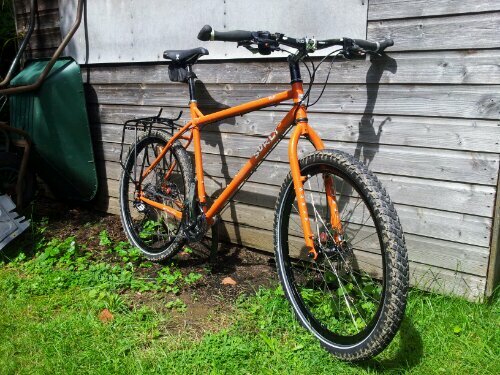 I’m riding an extremely versatile and robust orange Surly Troll steel mountain bike and carrying pannier bags. I´m constistently looking to drop weight. My current bike build and kit list (as of 06 June 2013 in Guatemala). Please feel free to leave a comment or send me an email which is my first name and last name (one word) at yahoo dot co dot uk. Does he / she have a name yet? ?